There’s a hint, just a whisper, of spring in the air. Finally. It’s been a long winter, sodden and grey with the odd gale thrown in to cut off the electricity and add to the gloom. The soundtrack? The rattle of rain on the window, persistent and mildly irritating. It rarely let up, churning the ground to sludge and seeping through the walls of the cottage leaving yellow stains and spots of mould on the white-washed walls. The firewood was always that little bit damp; the bed that little bit cold. The hens didn’t like it much either, hiding in their hut from the squalls and picking their way through the mud with a look of distaste. That’s what everyone told me it would be like. When I first moved here, in the first flush of summer, a neighbour warned me that by February most people have gone half-mad with the dark and the drizzle. I listened, nodded politely and dreamt of being snowed in, my cosy cottage surrounding by a vast, soft, silent, white landscape. Alas, this part of the west coast is pretty balmy and you don’t get the proper snowy winters of the north and the east. You get rain. Lots of it. 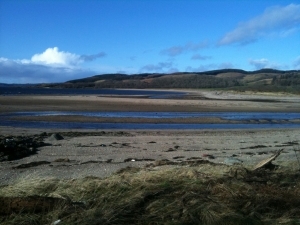 And the sun shines on Kilfinan Bay. But now we’re in March and finally I’m emerging from my damp cocoon and unfurling. For the last few days the sun has shone in a baby-blue sky, bringing light and colour to the land and a sparkle to the sea. The grass is beginning to grow and the first sorrel and dandelion leaves have appeared, miniature and tender. The gorse is in bloom, the bursting lemon-yellow petals defying the winter that’s still nipping the air. The birds are flitting between bare branches and the hens are clucking contentedly, pecking the warming soil. I opened my windows wide and felt spring on my face. Later, as I sat by the window writing this, the light dipped a few notches, the sky darkened and the rattle began. It turned to a hammer as the rain turned to hail, as if to remind me, loud and clear, that it’s not spring – just yet.